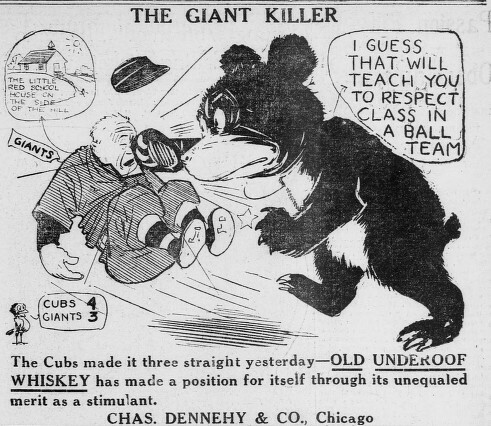 Two 1910 advertisements for Old Underoof Whiskey which appeared in The Chicago Daily News. The ad above appeared in the paper on May 12. The Cubs had just won their third straight game from the New York Giants, beating Rube Marquard, 4-3, to improve their record to 11-8. Hugh Fullerton wrote in The Chicago Examiner, that the Cubs, “chewed $10,999.98 of beauty out of the wry-necked, knock-kneed, cross-eyed and left-handed $11,000 beauty Marquard.” The Giants pitcher had earned the nickname in 1908 when New York paid that amount to the Indianapolis Indians for the 21-year-old pitcher. Through 1910, Marquard was a struggling pitcher with a 9-18 record who had all of baseball questioning the Giants purchase. The next three seasons Marquard would win 24, 26 and 23 games, helping to lead the Giants to three straight National League Championships. The one below is from June 27. 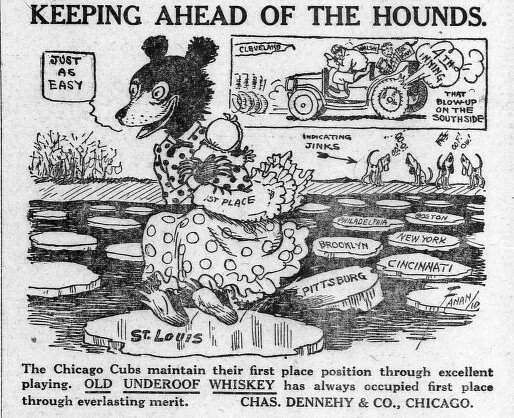 The Cubs had beaten the St. Louis Cardinals the previous day 3-2; scoring the winning run in the bottom of the sixth on a double steal, pulled off by catcher Johnny Kling and centerfielder “Circus” Solly Hofman. It was the team’s twelfth victory in the last fifteen games and gave the Cubs a 4 1/2 game lead over the second place New York Giants. The Cubs would run away with the pennant, 13 games ahead of New York.